AL-FLA Plastics has partnered with Rockville Partitions, a wholly owned subsidiary of General Partitions manufacturing, to offer the highest quality toilet partitions and urinal screens constructed of solid polymer (HDPE), solid phenolic core (SPC), fiberglass reinforced plastic (FRP), powder coated steel, stainless steel and plastics laminate. We also carry a full line of shower and dressing compartments, solid surface vanities, and benches to compliment our toilet partitions. With over 50 years of experience in manufacturing toilet partitions, Rockville Partitions has completed projects for the U.S. Pentagon, the Smithsonian National Museum of Natural History, Duke University and Wal-Mart just to name a few. 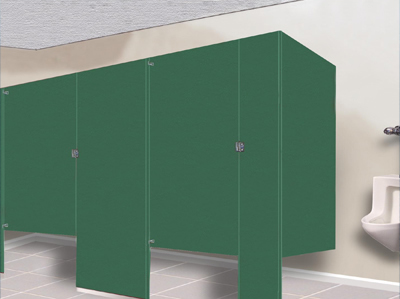 Not only are Rockville Partitions toilet compartments well constructed and attractive, but if they are properly stored, handled, and maintained under normal usage, they are guaranteed for 15 years. Whether your application calls for overhead bracing, floor mount, ceiling hung, or floor to ceiling toilet compartments, AL-FLA Plastics will gladly handle all of your needs. Give our sales team a call to help take care of all of your restroom and locker room needs.